I am not much of a photographer, though I've been trying to learn a little more about it since starting this blog. I do know the most basic principle, though, which is that the pictures I take should be in focus. A blurry picture really doesn't capture anyone's attention, no matter what the subject. A picture of my boys is a great thing to have for when they're older, unless they're so blurry you can't make out the silly faces they're making. A picture of my latest quilt is a necessity when I want to post about it here, but it's no good if readers can't make out the detail I've worked so hard on. Sharing my latest fmq work with blurry pictures wouldn't help anyone see what I've been doing, would it? So I have learned to look carefully at my pictures on the camera, checking to see that things are in focus and to take more pictures if I need to. There are times, especially when I'm working on a tutorial, when I want to be sure one part of the picture in particular is in focus. For example, in this picture (from my Stained Glass Star tutorial last week) I really wanted the presser foot and the line directly in front of it to be in focus. It took a bit of maneuvering to get the camera positioned so the arm of my machine wasn't in the picture, the presser foot was in the middle, and the camera wasn't trying to focus on the paper right at the front of the machine. It certainly helped that I can change the setting on my camera so that it only focuses where I tell it to, rather than on whatever is closest to the camera! When the entire picture isn't in focus, we tend to look mostly at the part that is in focus, don't we? We interpret that as being the most important part of the picture. In this example, the numbers on the paper are part of the picture, but they're not the most important element, so I didn't want the camera to focus there and make them seem more important than they are. 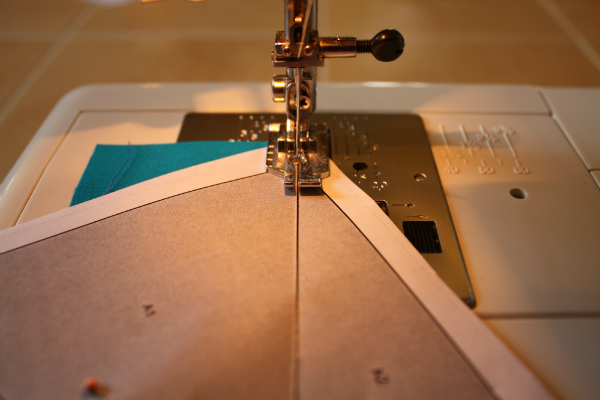 I wanted this picture to show that this step of the tutorial involved sewing directly on the line, so the paper passing under the presser foot is the most important element of the picture. When it comes to reading the Bible, sometimes we get things a little out of focus. We humans are a rather self-centered group, and we like things to be about us. Sometimes, though, a particular passage of Scripture may mention us, but not actually be about us. In other words, though we may be in the passage, we are not meant to be the focus. Ephesians 3:21,22 is a famous passage, one which you have probably heard often if you have spent much time in church. We are often reminded that God is able to do "immeasurably more than all we ask or imagine," and encouraged to trust in His power to accomplish amazing things in our lives. However, what He can do in our lives is not really the focus of the passage. The full passage says, "Now to him who is able to do immeasurably more than all we ask or imagine, according to his power that is at work within us, to him be glory in the church and in Christ Jesus throughout all generations, for ever and ever!" It is absolutely true that our minds could never possibly conceive of all that God's power could do. It is also absolutely true that He uses that power for our good, and that His power works within us. But none of those things are the focus of this passage. So why are we mentioned in the passage at all? I think it's to give us a greater sense of God's power. Saying God's power is immense, while true, is rather abstract. Saying God's power is so incredible that we can't even imagine all that He could do gives us a stronger picture of that power. We still can't truly grasp the magnitude of His power, but we have a better frame of reference for its immensity. We are not the focus of these verses. They are not a call for us to remember what God can do for us. They are a call for us to remember that his power is immeasurable and that all glory belongs to Him.